Giving Hope Lawn Management offers professional landscape design and installation services. We offer free consultations and quotes. To get your free quote call us today. We all would enjoy better lawns, but who has the time to tend to their yards? Even if you find some time each week to cut your grass, there’s so much more involved with keeping your lawns looking their best. You have many options in Richmond, VA, landscaping but only one choice gets the results you need each time. For affordable options in total landscaping services, you can always depend on Giving Hope Lawn Management! We offer affordable choices in monthly yard maintenance, landscape design, yard installations, and more! When you hire one company for all your home or commercial landscaping services, you can enjoy better quality each time. Call today for your best yard care solutions. We make more lawns look their best for longer! Whatever options will create your perfect yard, we are here for you each time. Call today for affordable landscape design choices! Typical yards only get constructed with grass and maybe a few trees. That leaves a ton of unused areas in your lawn. Many homeowners need new plants installed to fill in their outdoor areas. However, doing it yourself is often not the best option! If you don’t purchase the right plants for your soil, you could waste a ton of dead bushes and trees! Instead, we ensure you get the plant installations you need each time. Choose us for all your landscape installation services. Whether you’re planning on privacy shrubs or a shaded reading area, we have the solutions for you! Many landscaping companies sub out their design and installation jobs. That means you can never be sure of what you’re going to wind up with for your project. Instead, we offer complete landscaping contractor services at lower rates. We handle your yards ourselves each time to ensure you get only the best care possible. From better monthly landscaping to design and installation services, we can help you with all your yard concerns each time. Call today for total yard care solutions! For the best choice in local landscape design options, you can always depend on Giving Hope Lawn Management. Call us today for affordable rates on more lawn care services. 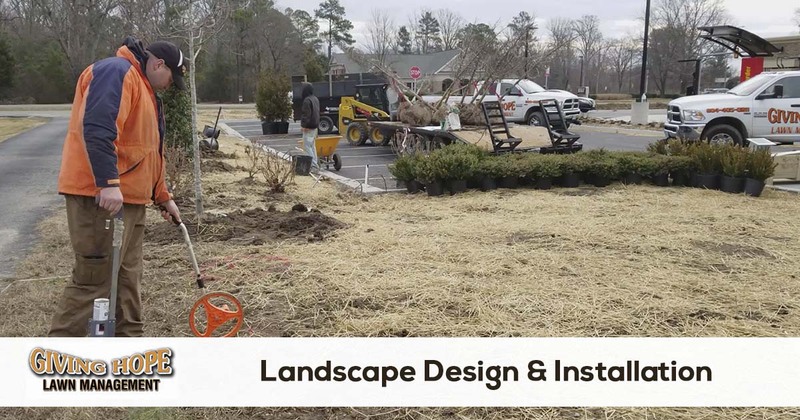 Contact us today for professional landscaping services that will turn your lawn and landscape into the picture perfect view that you and your home deserve. To request a free quote online today or give us a call.